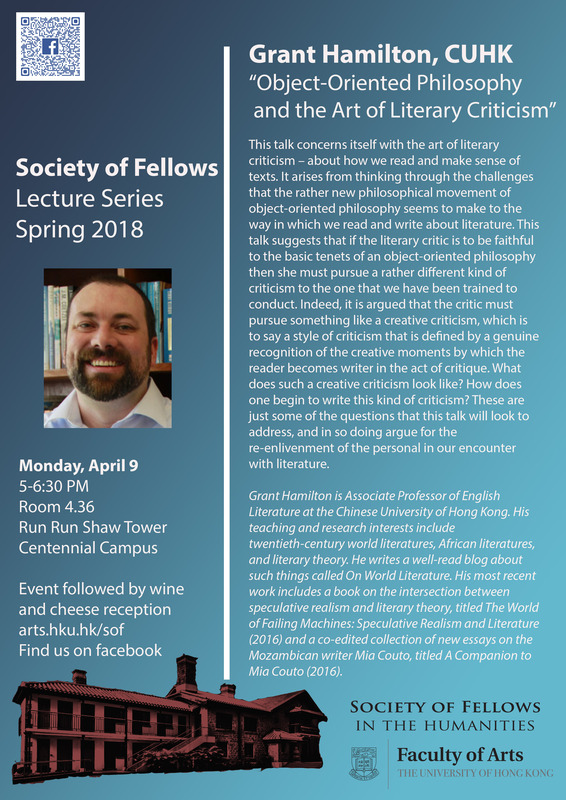 This talk concerns itself with the art of literary criticism – about how we read and make sense of texts. It arises from thinking through the challenges that the rather new philosophical movement of object-oriented philosophy seems to make to the way in which we read and write about literature. This talk suggests that if the literary critic is to be faithful to the basic tenets of an object-oriented philosophy then she must pursue a rather different kind of criticism to the one that we have been trained to conduct. Indeed, it is argued that the critic must pursue something like a creative criticism, which is to say a style of criticism that is defined by a genuine recognition of the creative moments by which the reader becomes writer in the act of critique. What does such a creative criticism look like? How does one begin to write this kind of criticism? These are just some of the questions that this talk will look to address, and in so doing argue for the re-enlivenment of the personal in our encounter with literature. Grant Hamilton is Associate Professor of English Literature at the Chinese University of Hong Kong. His teaching and research interests include twentieth-century world literatures, African literatures, and literary theory. He writes a well-read blog about such things called On World Literature. His most recent work includes a book on the intersection between speculative realism and literary theory, titled The World of Failing Machines: Speculative Realism and Literature (2016) and a co-edited collection of new essays on the Mozambican writer Mia Couto, titled A Companion to Mia Couto (2016).